Why is Ella Baker called the mother of the civil rights movement? Excerpt from “Fundi,” a film by Joanne Grant. (Running time 11:31) Used with permission. The complete film is available from Icarus Films. Visit the Ella Baker Center for more resources. 1963 March on Washington, National Mall. 1963 March on Washington, Lincoln Memorial. Follow her journey: Mississippi sharecropper, voting rights activist, international diplomat. Trailer for “Who is Unita Blackwell?” a film by Aaron Lehmann. (Running time 1:40) Used with permission. The complete film is available from Lehmann Film Productions. African-American women’s participation in the civil rights movement was encouraged and facilitated by a number of factors. Dating back to the 1930s and 1940s, black women had been active in local chapters of the National Association for the Advancement of Colored People (NAACP), an organization founded in 1909 that took the lead in raising public awareness of lynching and also orchestrated the legal challenges that eventually produced victories like the 1954 Brown decision. Another important institution was the Highlander Folk School in Tennessee, a unique blend of adult education and political activism. Begun as a training center for labor activists in the 1930s, it developed into a major seedbed for civil rights activism in the 1950s and 1960s, despite concerted efforts by conservative white Southerners to shut the interracial school down. Perhaps the most important roots for African-American women’s activism were in their own daily struggles for survival in their communities. Building on existing networks of kin and friendship embedded in local institutions such as black churches, black women knew who to turn to and how to get things done. This kind of local knowledge from “everyday kind of people” is how social movements work at a grassroots level. Recruiting friends and relatives through existing networks, meeting in safe spaces such as beauty parlors, and building support through door-to-door political canvassing, women quickly found themselves on the front lines of boycotts, voter registration drives, demonstrations, and even acts of civil disobedience that landed them in jail. Both young adults and older, more established community members answered the call. Take Rosa Parks. Our popular image is of a tired seamstress who refused to give up her bus seat to a white person. She may or may not have been tired, but she was far from a neophyte when it came to civil rights. For years she had been active in her local NAACP, and she had recently attended a workshop at the Highlander Folk School. Her refusal to give up her seat was part of a carefully crafted strategy to force the issue. 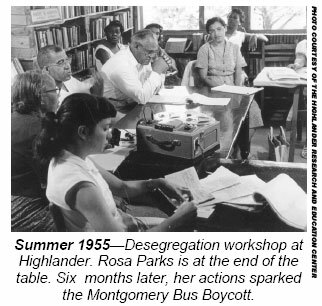 The ensuing yearlong boycott of the Montgomery bus system was organized and carried out primarily by black women, who turned to carpools instead of city buses to take them to white neighborhoods where they worked as domestics. Why was Little Rock Central High School the focal point of national controversy in 1957? Trailer for “Daisy Bates: First Lady of Little Rock,” a film by Sharon La Cruise. (Running time 1:08) Used with permission. The complete film is available from Sakkara Films. For more information, visit PBS and ITVS. The roll call of courageous Southern black women in the movement is long. After being denied the right to register to vote in Ruleville, Mississippi, Fannie Lou Hamer became a field secretary for SNCC and the driving force behind the Mississippi Freedom Democratic Party’s challenge to the all-white state delegation chosen for the 1964 Democratic National Convention in Atlantic City. Daisy Bates created an NAACP youth council in her hometown of Little Rock, Arkansas, and later provided emotional and physical support to the “Little Rock Nine” who desegregated the high school in 1957. Septima Poinsette Clark served as the director of workshops at the Highlander Folk School and later spread her concept of citizenship education through the South. The younger generation was well represented by activists such as Ruby Doris Smith, who was severely beaten while participating in the Freedom Rides challenging segregation on public transportation in 1961, and Diane Nash, who led the Nashville sit-ins while a student at Fisk; both went on to be active in SNCC. In many ways the civil rights movement had a ripple effect on later social movements, especially the revival of feminism. Drawing parallels between the status of African Americans and that of women (what Pauli Murray called “Jane Crow”), women individually and collectively challenged the structures of American life — social, economic, legal — that kept women from full citizenship and equality. Mobilization efforts on the part of Latinas, Native Americans, and Asian Americans challenged traditional feminist and civil rights organizations to broaden their representation to include an even wider diversity of women’s voices. In sum, many of the political upheavals of the 1960s, 1970s, and beyond had strong antecedents in the African American civil rights struggle.